URS offers Medicare Set-Aside Allocation services (MSA) in conjunction with our partner, ANS Rehab Consulting of Green Brook, NJ. 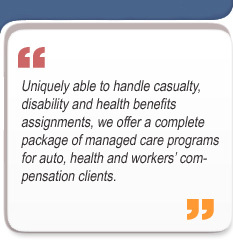 All MSA's are prepared by Medicare Set-Aside Certified Consultants. Allocations are developed following thorough review and evaluation of injury related medical costs normally covered by Medicare. 2. If settlement value is over $250,000 (inclusive of indemnity, attorney fees and costs) and an individual is reasonably expected to become entitled to Medicare within 30 months. URS, through its MSA partner, provides a local and reliable solution for attorneys and employers who wish to move forward in the settlement process. By having Certified MSA staff who are also R.N.s familiar with the cost of medical treatment, medications and supplies which are being set aside, the likelihood of Medicare challenges are minimized.